MOON TOWNSHIP — Matty McConnell drives to the hoop against Saint Francis on January 31, 2019 (Tim Kelly/RMU Sentry Media). MOON TOWNSHIP — History was made on Thursday night as Matty McConnell passed 1,000 career points as the RMU men’s basketball team (12-10, 7-2 NEC) fell to Saint Francis University (9-11, 5-4 NEC) by the score of 76-73. For much of the first half, RMU led on the scoreboard. Their scoring started with a three-pointer from Josh Williams almost a minute into the game. The Colonials were able to extend their lead, all the way up to fourteen in the first half, with 5:44 left to play. A big part of that was the play of Matty McConnell, who had all 11 of his first half points within the first fifteen minutes. 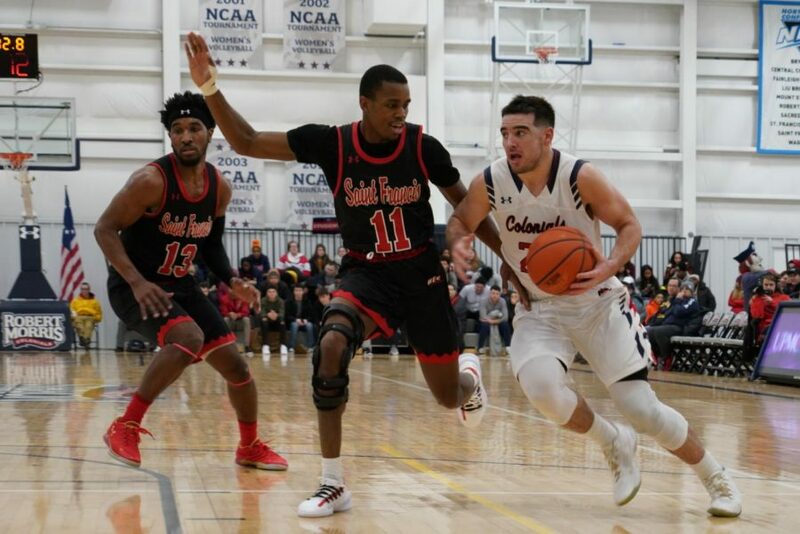 After the Colonials extended their lead to 14, Saint Francis began to chip away. Saint Francis outscored RMU 21-7 in the last 5:44 of the first half. This run included a stretch in which SFU scored seven points in the last 30 seconds of the half, when they also generated two turnovers. Saint Francis led 41-39 when the first half ended. Before heading into their locker rooms. The two teams got into a shoving match on the SFU side of the floor and needed to be seperated by coaches and the officials. Yannis Mendy of Robert Morris and Myles Thompson of Saint Francis were ejected from the game, and both teams recieved a pair of free throws to start the second half. Saint Francis came out of the gate with a 8-1 run which extended their lead to 49-40. 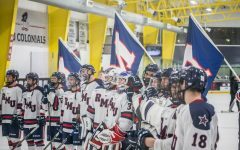 They eventually were able to get their lead into double-digits before RMU started to climb back into the game. At the second media timeout though, RMU still trailed by nine and McConnell was one point away from history. McConnell was fouled at the 10:47 mark, which sent him to the line for a 1-and-1. McConnell made both, with put him at 1,001 points in his career, the 25th player to do it in Colonial history. About two minutes later, another McConnell free throw tied things up at 65-65. McConnell ended up with 24 points on the night, which set a new career-high for the Colonial. SFU entered the last media timeout up 72-68. This was just the second time in NEC-play that RMU has given up 70 points in a game. 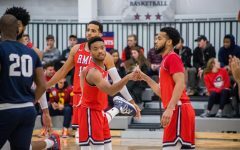 The other was the 80-73 loss that RMU suffered to LIU Brooklyn on January 12. RMU pulled within one at 74-73 with 1:16 left in the game after another McConnell free throw. About 20 seconds later, McConnell went to the line again with a pair of free throw. He missed both free throws and SFU got the ball back. Saint Francis had a chance to close the game, but an air ball by Jamaal King was all they could muster. RMU got the rebound and quickly brought the ball up the court, and called a time out with 10.7 left in the game. The ball was in-bounded to Jon Williams. Williams, immediately found McConnell who drove to the hoop to try and give RMU the lead. As he was driving to the hoop, McConnell slipped and the ball went out of bounds. Saint Francis got the ball back and hit two free throws to extend their lead to 76-73. RMU failed to inbound the ball and Saint Francis won the game 76-73. Despite passing 1,000 points and having a career-high in points with 24, McConnell blamed himself for the loss. After the game he said that was because he was, “6-11 from the free throw line.” He also referenced moments late in the game in which he missed free throws late in the game. 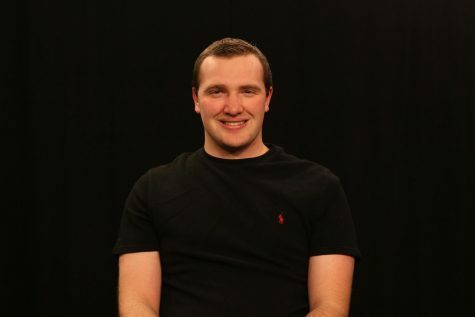 Coach Toole, on the other hand, credited McConnell for keeping them in the game despite the final play at the end. 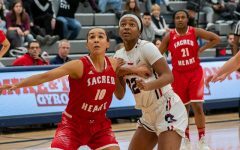 It was the second NEC loss of the season for RMU, but they still sit alone atop the conference with a two-game lead over a plethora of teams as Saint Francis Brooklyn (10-11, 5-4 NEC) fell to Central Connecticut State (9-13, 3-6 NEC) by the score of 78-72 on Thursday night. Speaking of a plethora of teams, there are five teams in the NEC tied for second behind RMU, and all NEC teams are within five games of first place. 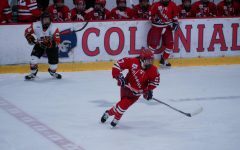 The Colonials return to action on Saturday at 4:30 p.m., as they take on Fairleigh Dickinson (10-11, 5-4 NEC) in New Jersey. Robert Morris’s next home game is against Bryant (8-12, 5-4 NEC) on Feburary 7th with tip-off scheduled for 7:00 p.m.